According to a "Safe Browsing" advisory from the search giant, Eyman's site [don't click, for the love of humanity! ], is "listed as suspicious" and "may harm your computer." It seems that destroying our state's tax base, abolishing affirmative action, opening up HOV lanes to single-driver SUVs, and legalizing discrimination on the basis of sexual orientation were not sufficiently malicious gambits for Eyman to attempt. Now his malware is extending beyond public policy into the digital realm itself. The reason Google has Eyman's site marked as untrusted is because its crawler discovered malicious scripts that were recently injected into the site's code. Of the 16 pages we tested on the site over the past 90 days, 6 page(s) resulted in malicious software being downloaded and installed without user consent. The last time Google visited this site was on 2009-11-24, and the last time suspicious content was found on this site was on 2009-11-11. Malicious software is hosted on 2 domain(s), including newtechnologyconference.co.uk/, ppl-14.ru/. 1 domain(s) appear to be functioning as intermediaries for distributing malware to visitors of this site, including ppl-14.ru/. It appears whoever handles Eyman's site has successfully removed the malicious scripts since Google discovered them, although it's not clear if Eyman and Company have taken any additional precautions to guard against future exploits. Internet security is very serious matter, but too few administrators - and an even smaller percentage of users - are as paranoid about staying safe as they should be. It is possible to configure one's browser to protect against malicious scripts and bad neighborhoods on the World Wide Web. For users of Firefox, this means installing a simple add-on, called NoScript, which blocks scripts by default and allows them for websites that a user has marked as trusted. I've used NoScript for years, and it conveniently blocks most advertising and unwanted garbage on web page in addition to malware. In fact, I use NoScript to prevent Google from spying on me as I surf the Net (which Google can do with its own scripts, including Google AdSense and Google Analytics). Had I visited Eyman's website while it was infected, nothing would have happened to my computer, because NoScript would have prevented that malware from getting into my machine in the first place. But I'm unlike most users; I take security very seriously. Securing websites is trickier and requires more technical expertise than securing a browser, which is one reason why most webmasters lease space and bandwidth from a host, company that specializes in serving websites. The host employs people who are responsible for securing the machines that serve their clients' websites. It is, again, unclear who cleaned up Eyman's website and got rid of the malicious scripts. It could have been Eyman's webmaster. Or his host. Whoever it was, they failed to act until after Google had started warning users that Eyman's site was unsafe. Hopefully Eyman's people have got things locked down now so that users who visit are only exposed to Eyman's bad ideas and nothing else. Senator Cantwell opposes "casino capitalism"
A cash cow hidden from public view and run with less oversight even than actual casinos. Look no further than the powerful lobbying arm of the financial services sector, which has spent at least $220 million this year lobbying Congress to stave off new rules to prevent another collapse. That is over $500,000 in lobbying for every member of Congress, which might help explain why, to date, nothing has been fixed in our porous financial regulatory system. Americans want to know when Congress will put an end to the Wall Street's secret off-book gambling schemes and restore our capitalist system by requiring real transparency and true competition. Cantwell's legislation would repeal a section of a 2000 law, the Commodities Futures Modernization Act, that exempted derivatives from regulation under state gambling laws. (Yes, this investment scheme is so reckless that gambling laws apply.) By repealing this exemption, state gambling regulators and attorneys general are free to examine derivatives trading and use their powers to protect the public from any unscrupulous activity. The legislation Cantwell, Wyden and Sanders proposed today sends the message to derivatives dealers that if they somehow succeed in preserving regulatory loopholes at the federal level, they will still face tough regulatory oversight at the state level. Within hours of introducing her legislation, Wall Street was already pushing Cantwell to abandon her plans. But Senator Cantwell isn’t willing to let “casino capitalism” bring down the American economy a second time. Let's bring derivatives out of the dim casino and into the sunlight of public scrutiny. Four local police officers were killed this morning at a Parkland-area coffee shop, and dozens of investigators backed by search dogs and a helicopter were hunting for their killer. Witnesses described the killer as a black man, 5-foot-8 to 5-foot-9, in his 20s or 30s, with scruffy facial hair and wearing a black coat and blue jeans. He walked into the Forza coffee shop at 11401 S. Steele Street about 8:30 a.m. and opened fire on the four officers, who were at a table doing pre-shift paperwork. Investigators have appropriately launched a massive manhunt to find the suspect who committed these acts of evil. A special tips line has been set up at 1-866-977-2362 and a $10,000 reward is being offered. The four officers - three men and one woman - were sitting at a coffee table working on their notebook computers at the time of the shooting. According to news reports, they were wearing bulletproof vests, but the vests did not prevent their cold-blooded killer from ruthlessly gunning them down, execution style. How many more police ambushes have to happen before we do something about the lax rules that make it easy for criminals to get their hands on guns? You say we're naive to think we'd have less violence in society if guns were banned. I could say you're naive if you believe everyone who has a gun is going to use it respectfully for self-defense. So let's quit calling each other names, and work together to see how we can stop the violent anger percolating all around us. If people weren't so hair-trigger angry all the time, they'd buy fewer guns in the first place. Let's concentrate on social justice. Maybe we could consider working together as a gift to the families of the officers who were slain last night in memory of their loved ones, instead of all this mean-spirited arguing in the shadows. NPI extends its deepest condolences to the families and colleagues of the slain officers. This is a terrible tragedy, and we pray that the person who committed it will be caught and punished appropriately in a court of law. There will be a prayer vigil tonight at the Tacoma Champions Center at 6 PM to remember the officers and show solidarity for their families. Yesterday, as we were going around the Thanksgiving day table sharing what each of us was thankful for, after listing friends, family, and a roof over our heads, I had to add that I'm thankful that debate has finally begun on the Senate's health care bill. It's a long overdue, and incredibly significant step towards the reform we've needed for decades. Yet, astonishingly, there are still people in this country who don't think we need reform. People who think, or have been convinced, that our health care system is just fine the way it is. Not too long ago, NPI received an e-mail message from one of these people, a right-winger who asked to remain anonymous. He offered us $100 if we could cite just one example of someone who got sick and died in America due to lack of health care coverage. As if our motivation for caring about heath care reform was so we could put a few bucks into our coffers. I think the offer shows more about what Mr. Right Winger values than anything else, but regardless, examples are not hard to find. Indeed, the website NamesOfTheDead.com offers a place where people can share stories about their loved ones who have, in fact, gotten sick and died because they didn't have sufficient health care coverage. This, in the richest nation on the planet. So, Mr. Right Winger, here are just a few people--and not from anywhere in America, but from right here in Washington state--who might not have died had quality health care coverage been available at a price they could afford. These are people who might have enjoyed a Thanksgiving turkey with their families yesterday and shared their own thanks for having had, in the richest nation on the planet, the best health care anywhere when they needed it the most. But they couldn't, because they didn't, and so they died. George Klacsanzky, died age 47. George worked at a hospital, but had no health insurance. When he got sick from a simple virus, a doctor told him to check into a hospital. George didn't, because he knew he couldn't pay for it. He died in his bed that night, two blocks away from the hospital where he worked. Mike [Last Name Withheld], died age 50. Mike and his wife went for years without health insurance--and without basic medical care and screening--because they couldn't afford it. A year ago, Mike landed a job that offered coverage, so he went to the doctor for an ache in his stomach that had been nagging him for years. His doctor discovered cancer that had spread all over his body, a diagnosis that came much too late for any hope. Sheryl Everson, died age 55. Sheryl and her co-workers knew they were all going to be laid off from their jobs as school bus drivers, because they company they worked for was being taken over. Sheryl discovered a lump in her breast, but she knew she wouldn't be able to afford COBRA coverage after the layoffs, so she decided to wait until she had a new job with the new bus company before going to the doctor. That way, she wouldn't be denied coverage for a pre-existing condition. She waited seven months before seeing a doctor, and, well, you know the rest. She wouldn't be on this list if breast cancer hadn't killed her. So there you go, Mr. Right Winger. Not just one example, but three. Not from the whole of America, but from our own backyard. Real, ordinary, every-day people, just like you and me. People who delayed or did not seek medical care because they didn't have insurance, or because they understood how the system is rigged to take your premiums but never pay out. People for whom quality, affordable insurance could well have made the difference between life and death. People for whom the Senate's debate, while welcome to the rest of us, came too late. As for that hundred bucks, Mr. Right Winger, I'll leave it to you and your conscience whether you want to make good on your promise. Like I said, NPI isn't in this for the money. Today we take the opportunity to reflect on all the blessings that are ours, and gather with family and friends to be nourished by good food and drink. Even though times are tough, and we have so much work to do to reduce suffering in America, we have much we can appreciate. We're thankful to all our fellow activists who have finally supported the Northwest Progressive Institute this year. We couldn't exist without you! We're thankful that voters overwhelmingly said NO to Tim Eyman's Initiative 1033, which would have trapped us in a permanent recession. We're thankful that the people of Washington were first in the nation to take a stand in favor of LGBT rights at the ballot by approving Referendum 71. 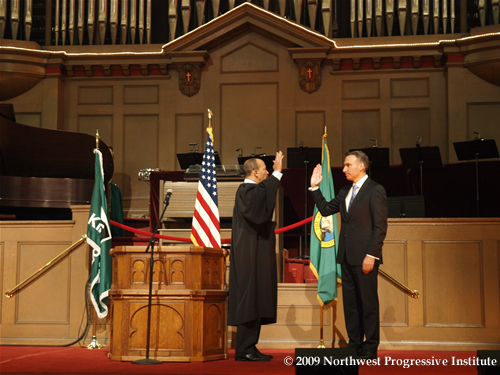 We're thankful that Dow Constantine is our new King County Executive. We're thankful that Lloyd Hara is our new King County Assessor. We're thankful that Julie Anderson is our new Pierce County Auditor. We're thankful that Dave Somers and Dave Gossett, two great progressives, were reeelected to the Snohomish County Council. We're thankful that two of us were able to go to Pittsburgh this year and represent NPI at the fourth annual Netroots Nation Convention. We had a blast. We're thankful that several staff members were able to witness the historic inauguration of Barack Obama in person on January 20th. We're thankful that Sound Transit Central Link - a project which we fought for years to protect - has finally opened and is now in service. We're thankful for Representative Alan Grayson, who has been doing a remarkable job of speaking truth to power in the halls of the U.S. Capitol. For centuries, in peace and in war, in prosperity and in adversity, Americans have paused at this time of year to gather with loved ones and give thanks for life’s blessings. This week, we carry on this distinctly American tradition. All across our country, folks are coming together to spend time with family, to catch up with old friends, to cook and enjoy a big dinner – and maybe to watch a little football in between. As always, we give thanks for the kindness of loved ones, for the joys of the previous year, and for the pride we feel in our communities and country. We keep in our thoughts and prayers the many families marking this Thanksgiving with an empty seat – saved for a son or daughter, or husband or wife, stationed in harm’s way. And we say a special thanks for the sacrifices those men and women in uniform are making for our safety and freedom, and for all those Americans who enrich the lives of our communities through acts of kindness, generosity and service. But as much as we all have to be thankful for, we also know that this year millions of Americans are facing very difficult economic times. Many have lost jobs in this recession – the worst in generations. Many more are struggling to afford health care premiums and house payments, let alone to save for an education or retirement. Too many are wondering if the dream of a middle class life – that American Dream – is slipping away. It’s the worry I hear from folks across the country; good, hard-working people doing the best they can for their families – but fearing that their best just isn’t good enough. These are not strangers. They are our family, our friends, and our neighbors. Their struggles must be our concern. That’s why we passed the Recovery Act that cut taxes for 95 percent of working people and for small businesses – and that extended unemployment benefits and health coverage for millions of Americans who lost their jobs in this turmoil. That’s why we are reforming the health care system so that middle-class families have affordable insurance that cannot be denied because of a pre-existing condition or taken away because you happen to get sick. We’ve worked to stem the tide of foreclosures and to stop the decline in home values. We’re making it easier to save for retirement and more affordable to send a son or daughter to college. The investments we have made and tough steps we have taken have helped break the back of the recession, and now our economy is finally growing again. But as I said when I took office, job recovery from this crisis would not come easily or quickly. Though the job losses we were experiencing earlier this year have slowed dramatically, we’re still not creating enough new jobs each month to make up for the ones we’re losing. And no matter what the economists say, for families and communities across the country, this recession will not end until we completely turn that tide. So we’ve made progress. But we cannot rest – and my administration will not rest – until we have revived this economy and rebuilt it stronger than before; until we are creating jobs and opportunities for middle class families; until we have moved beyond the cycles of boom and bust – of reckless risk and speculation – that led us to so much crisis and pain these past few years. Video of the address is also available at WhiteHouse.gov. Nearly ten months after Ron Sims announced he was resigning as King County Executive to become the Deputy Secretary of Housing and Urban Development, his successor, Dow Constantine, has finally taken office. In a simple, cheery ceremony at Daniels Recital Hall (which he helped to save from destruction) Constantine took the oath of office and delivered his inaugural address, built around the theme of more effective government. "The world around us is changing," Constantine noted. "King County will change as well. We are looking to build a King County government that is more user-friendly, transparent, efficient and effective. This is a tall order." "We will need all hands on deck to succeed," he added. Among those hands will be newly appointed Deputy Execcutive Fred Jarrett, one of Constantine's primary rivals, and Constantine's new Director of Customer Service, Lorrie McKay, who were mentioned in Constantine's speech. Dow also outlined several specific objectives he wants to accomplish: expanding light rail north, east, and south, as promised to voters, create green jobs, encourage transit-oriented development, bring the county's other elected leaders together for a frank discussion about revenue and tax reform, reprioritize Metro services and get rid of the old 20/40/40 formula, protect farmland in rural communities, and launch a formal clearinghouse for employee-led reform ideas. Asked afterward who he might appoint to the Sound Transit Board (there are several vacancies to fill) Constantine told NPI he'll be looking for someone who has demonstrated commitment to high capacity transit. "It's very likely that I will be appointing someone representing the City of Bellevue," he said, "because so much of the action over the next few years is going to getting East Link built." "But there will be many appointments," he continued. "There's a lot of tough decisions to be made: Regional equity, people who are able to move the agenda forward [...] are important considerations for the Executive." The King County website has already been updated to reflect Dow's inauguration. His prepared remarks are available there, along with staff biographies and photos from the event at Daniels Recital Hall tonight. Every year 1.94 billion gallons of untreated sewage and polluted runoff from Seattle and King County are discharged into the Sound and other bodies of water as a result of overflows. That’s a whole lot of yuck. As you know if you’ve ever walked by a storm drain stenciled with the warning “Drains to stream, lake or bay,” many storm drains funnel rain directly into the nearest body of water. The Seattle Aquarium estimates that more than two million gallons of motor oil washes off our roads and into the Puget Sound every year. Sometimes, waste has overflowed just upstream from drinking water intake points or near public beaches. Inadequate sewage systems threaten human and environmental health. Pressure from the EPA has led Democratic lawmakers in Washington to come up with a sensible plan to strengthen the state's water infrastructure in order to keep people and water healthy, and create good-paying jobs in the bargain. The Clean Water Act of 2010 would provide pollution prevention funding to local governments who are already tapping limited budgets in order to clean up and prevent storm water pollution. The funds would be generated through a $1.50 per barrel fee on the petroleum products that contribute to storm water pollution. This program was known as "Invest in Clean Water” when it was a top legislative priority of the Environmental Priorities Coalition last year. The Invest in Clean Water bills, HB 1614 and SB 5518, weren’t very successful, but this year their future looks brighter. At a recent meeting with local Democrats, Speaker of the House Frank Chopp presented the Clean Water Act as a House Democratic caucus legislative priority. This is the kind of support that moves bills through the Legislature. Another motive for supporting the bill is the fact that storm water control creates good jobs, a goal at the forefront of lawmaker’s thoughts. Sewage systems mostly run under our feet, out of sight, out of mind, yet they are another public system funded by tax dollars that makes life in America more safe and comfortable. Let’s not take them or the governments that build and maintain them for granted. To do so would invite more sickness, closed beaches, contaminated shellfish and polluted bodies of water. The Senate voted on Saturday to begin full debate on major health care legislation, propelling President Obama’s top domestic initiative over a crucial, preliminary hurdle in a formidable display of muscle-flexing by the Democratic majority. Don't expect this to become a habit. Several ConservaDem senators (cough, ahem, like Mary Landrieu and Ben Nelson) have flatly stated they won't vote for healthcare reform if it includes a public option. Because that would make their corporate taskmasters unhappy. And they wouldn't want that. The sixty to thirty nine vote was strictly along party lines, so Pacific Northwest senators voting yes were Democrats Maria Cantwell, Patty Murray, Jeff Merkley, Ron Wyden, Max Baucus, Jon Tester, and Mark Begich. Pacific Northwest senators voting no were Republicans Lisa Murkowski, Mike Crapo, and Jim Risch. The President is gratified that the Senate has acted to begin consideration of health insurance reform legislation. Tonight’s historic vote brings us one step closer to ending insurance company abuses, reining in spiraling health care costs, providing stability and security to those with health insurance, and extending quality health coverage to those who lack it. The President looks forward to a thorough and productive debate. The successful vote tonight took our country one step closer to finally reforming our broken health care system and at long last helping millions of families and small business owners get the coverage they need at a price they can afford. As we begin debating this bill on the floor of the Senate, I continue to call on my colleagues across the aisle to rise above partisanship and work with us to provide families across the country with stable, affordable health insurance coverage. Our health reform bill will lower costs for families and small business owners. It will ensure that no one will be denied coverage for a pre-existing condition or go bankrupt if they get sick. And it finally makes insurers compete for the business of the American people. For months, as I have worked on this bill, I have fought to ensure that the needs and priorities of Washington state’s families and businesses are preserved. I will continue to tell the stories of Washington state businesses and families as we work to pass a bill that makes our nation and economy healthier and stronger. This debate is far from over, but we have now come further than any Congress in a generation in completing the difficult task of fixing health care. I look forward to continuing to fight for reforms that will make health care more accessible and affordable for all Americans. And I hope that my colleagues who opposed even having a full discussion about this issue will realize how important it is that the Senate debate health care reform. The health care system is no longer working for working Americans. Too many are without insurance; too many others fear they will lose coverage when they need it most. Health care costs are bankrupting families and hampering business growth. We must act now to contain costs, expand access to coverage and reform the insurance industry practices that have made even those with insurance fearful as to what will happen should they become ill or injured. This vote represents a major step toward a goal that has eluded us for generations: a significant reform of our nation’s health care system. Despite partisan differences, a remarkably strong consensus has formed over our basic aims: maintaining quality, reining in out-of-control costs, and covering the uninsured. During debate, I intend to work with my colleagues to preserve the many strong measures in the bill and to strengthen provisions that will further drive down costs for families and businesses. Thanks to each of them for standing strong in the face of Republican obstructionism. The challenge only gets tougher: Now Majority Leader Reid has to actually get a bill out of the U.S. Senate and into conference committee. Corralling ConservaDems on a procedural motion is one thing, but getting them to vote against insurance companies and HMOs for a progressive, substantive bill is another. If there was ever a time to whip the caucus, these next few months will be it. Great news for rail fans: Tomorrow Amtrak Cascades will begin stopping at Stanwood in Snohomish County on its way to and from Seattle or Vancouver, British Columbia. The town and nearby Camano Island have been without passenger rail service for decades, but that travesty will end tomorrow morning with the opening of the new Stanwood Station, under construction since April. Senator Mary Margaret Haugen, Transportation Secretary Paula Hammond, and local leaders will be on hand for the arrival of the first Amtrak Cascades train to stop in Stanwood. That train will roll in at 9:03 AM. "This has been a long time coming, and it’s going to make a huge difference for so many people in so many ways," Haugen said in a statement announcing tomorrow's opening ceremony. "Everywhere I go, people are talking about the train station." Senator Haugen is the Chair of the Senate Transportation Committee, and played a pivotal role in ensuring the project got moving. The northbound and southbound Cascades trains will each stop in Stanwood twice a day: once in the morning, and once in the evening. The new Stanwood station won't be staffed by any Amtrak agents, but riders boarding the train there may purchase tickets online or by calling 1-800-USA-RAIL. It looks like the Governor Gregoire that we know and love - the courageous governor who's not afraid to stand up to Tim Eyman and conservative editorial writers - it looks like that governor, at long last, is finally back in action. Minutes ago, at Senator Jeanine Kohl-Welles' sixteenth annual post-election analysis fundraiser, Gregoire declared emphatically that cuts cannot be the only answer to the $2.6 billion shortfall the state is facing. "It's not an option," Gregoire said firmly, to rousing cheers and applause from assembled Democrats. Gregoire acknowledged in her remarks that half-measures and shortcuts won't work anymore. And she's absolutely correct. If it was easy, the Legislature already did it last session. Now, with nothing left to cut but bone, it is absolutely critical that we raise revenue to protect our essential public services from destruction. GOVERNOR GREGOIRE: I come tonight - I got to run and do something else - but I wanted to reflect a little bit about the last election. And first, to say thank you, King County, for Dow Constantine, a great partner for us [in the statehouse]. And a big thank you to the City of Seattle for giving us a great mayor in Mike McGinn. Thank you. And you know what? We're the only state in the nation - the only state in the nation! - that has gone to the ballot and said no to discrimination, yes to equality, all families will be protected, Approve 71, thank you! I had a conference call with some of my Democratic colleagues, and I said, I am proud to be a Washingtonian, folks! Thank you very much for what you did on R-71 and making it happen for the great State of Washington. It goes without saying... today has not been my best day. It goes without saying... the last week has not been my best week. We had a shortfall that we found last Friday from our forecast and caseload that took us down $300 million, and with reasons that we can all understand. People need healthcare, people need services, they need the social serivce net. Today we found our revenue forecasts down $760 million. It's a billion dollars in one week. Now, I gotta explain, if I can, a little bit about the budget so that you can explain it to the sixty three percent of Washington State who doesn't understand the dire consequences of a budget like what we have. Seventy percent of our state budget is untouchable. It's basic education, protected by the Constitution; it's Medicaid, protected by federal law. So only thirty percent - only thirty percent - is available for us to find any cuts. That thirty percent is nine billion dollars. We have a $2.6 billion shortfall. That puts it in perpsective. But you know what? I gotta tell you, if it was ever a time to have a Democratic governor, a Democratic House, and a Democratic Senate, now is the time, in the worst recession of the history of the State of Washington, [Applause] because we care, we have values, and we're not going to let it get us down! By law, on December 8th, I will produce for you a budget. That budget has to live within revenue. It will be nothing like you have ever seen in your life. Last Saturday, we spent the day trying to find budget cuts. Let me give you a flavor for the day. At one point we were looking at pediatry services, and asking ourselves, Should we cut that funding? I ask what the consequence would be. And the answer was, more people will have amputations. I ask, what would be the consequences of cutting those developmentally disabled who are aging out of foster care. The answer was, they'll go homeless. Those are the kind of consequences to our budget. It's one thing to talk about, you can shut down all of higher education - all our four years, our research insitutitons, our community and technical colleges - and still not make up the whole. You can shut down all of corrections, and still not make up the whole. But you know what? It's not about numbers. It's about real human beings. Behind those numbers, my friends, are kids who want a education so they can get out and get a good job or go to college. Behind those numbers are kids who want the doors to higher education open to them for training in their field or for a PhD. Behind those numbers are families who are looking for a safety net because they have lost everything. They may have lost their job and their healthcare; they're looking for food on the table and a roof over their heads. Behind those numbers are our senior citizens who need access to a nursing home. It will not be easy. There are three editorials - Vancouver, Walla Walla, and Yakima - today. Give 'em a shout out: They're wrong! We cannot live, that's not the values of the people of the State of Washington. We need to stand up, we need to be proud. Let me just share with you... I have read more about the Great Depression in the last year than I have in my entire life. And I know one thing: Turning our back on the most needy, it's not the people of the State of Washington. Turning our back on education and healthcare does not represent the people of the State of Washington. Turning our back on economic opportunities for tomorrow does not represent the people of the State of Washington. So I'm asking you to join with us: Go out there and fight and educate. Make it clear: We'll take cuts, we have to, we know that, every family is doing it. But we cannot allow our most fragile to go without. We cannot shut the doors to higher education. We cannot turn our backs on our kids' ability to get an education in our K-12. We cannot turn people away from healthcare. It is time for Washington State to stand up, to stand behind its values, get back to work, look out for our friends, our neighbors, look out for that stranger down the street or someone we don't know. I'm asking you from the 36th and the wannabes in the 36th, stand behind us this next legislative session. Let's get the job done, let's work together, let's show America what real leadership is about, right here in Washington State. Thank you all. Senate Majority Leader Lisa Brown and House Majority Leader Lynn Kessler - who sat next to each other as part of the panel - both agreed that the Legislature has no choice but to raise revenue. The alternate is the desutruction of essential public services that Washingtonians rely on in their daily lives. We simply won't recover from this recession if we cut off our most vulnerable. The Legislature should have acted earlier to raise revenue. We were very disappointed with the choices made by House and Senate Democrats in the 2009 session. It's a relief to hear Governor Gregoire promising to fight for our common wealth. For us, fighting back against Tim Eyman is difficult enough: We need a champion who is willing to on offense to protect our common wealth. So we say, thank you, Governor, for renewing your commitment to progressive ideals. Now, go out and execute, and we will be beside you every step of the way. A few months after confirming its intention to turn its "Chrome" browser into an operating system, search giant Google has taken the wraps off its product plans, eliciting breathless coverage from tech blogs and traditional media outlets. The basic gist is this: Google ois slapping its name, logo, and browser shell on top of a collection of free software to create Chrome OS because it wants to generate even bigger profits. Chrome OS will come installed on new netbooks (with hardware certified by Google) beginning in a year. Oddly enough, we've already seen tech journalists and pundits describing Chrome OS as a great leap forward or a milestone in the history of computing. They've apparently never heard of thin-client workstations, which have been around for years and - like the netbooks on which Chrome OS will be sold - are restrictive by design. Thin client workstations are common in libraries, which maintain terminals for patron Internet access and use of selected programs like Microsoft Office or Adobe Reader (the most common PDF viewer for Windows). Chrome OS, however, won't have any desktop applications. Instead it will contain shortcuts to websites (especially Google-owned websites) where users can read/write email, watch videos, or edit documents. The reason Google is creating Chrome OS is that the company's ambitions extend far, far beyond being the dominant search engine. Google makes money by storing information and monetizing it for profit. That is why it is seeking end-to-end control of personal computing. Chrome OS isn't intended to help users; it's being created to mine their data so Google can turn a bigger profit. Netbooks running Google Chrome OS will be similiar to library workstations... minus the privacy protections that libraries provide to patrons. While Microsoft and others say they believe that cloud-based programs will coexist with traditional PC software, Google has often said that Web applications will replace all desktop software, another area that Microsoft dominates. Google and its executives are free to think that the future of personal computing is a mass migration to their data-mining products, but they're mistaken. Desktop software is not headed for extinction. There are too many things web browsers cannot do or are not well suited for. Like gaming, multimedia editing, or publishing. What's more, "web apps" will never be as versatile as desktop applications, because they rely on connectivity to the Internet to work. (Otherwise, they wouldn't be "web apps".) Therein lies the problem: it's not always possible to connect to to the Internet, let alone connect at a high speed. A desktop application, unlike a "web app", can be used offline as well as online, permitting a traveler to command a virtual army from twenty thousand feet up while crossing from coast to coast or allowing a worker out in the field to record raw data for later analysis. What so many people who have fawned over Chrome OS don't seem to understand is that there's nothing revolutionary about it. Free software, like the Ubuntu Netbook Remix, is already available for today as an alternative to Windows. Chrome, on the other hand, will be perfect for people who like the idea of a private version of the National Security Agency tracking where they go online, sifting through their data, and building profiles of them to sell advertising. Earlier tonight, a packed house attended Sound Transit's fourth East Link workshop, held in at City Hall in downtown Bellevue, where residents were invited to submit comments about Sound Transit's plans for the voter approved project. Throughout the presentation, we were given an overview of the different ideas. The current Sound Transit preferred alternative is C4A. C4A would be an at grade alignment running down 108th Ave and 110th Ave from Main Street to NE 12th, crossing Interstate 405 at NE 12th St. There's probably not a single person in this room who supports the C4A approach... It will destroy our city, it will destroy our traffic patterns, it will create congestion, it will have safety impacts, yet Sound Transit just goes merrily along with its preferred approach. Many others in the audience were hostile to Sound Transit too, claiming East Link will destroy their neighborhood. Speaking afterwards to NPI, Ruttkamp took the opportunity to extend and revise his remarks. They want to run a train down our street... The only reason they want to do it is because it's the cheapest way to do it. And that's the only answer that they ever have. It's cheapest. Well, there's lots of things in life that are cheapest, but they're not the best. But even his denunciation of East Link couldn't match the effusive objections made by a crew of Surrey Downs residents who are fiercely opposed to any proposed alignment within a mile of their homes. With Councilmember-elect Kevin Wallace as their leader, they demanded that Sound Transit forget about going through downtown and instead run the line along Interstate 405. Their ironically named "Vision" plan would have a Bellevue Transit station on 114th St, six blocks away from the Transit Center. In addition, the "Hospital" station would be behind Whole Foods, crossing a busy street. It would also be at least a 10 minute walk from Overlake Hospital. Asked for comment, Sound Transit officials explained to NPI that the "Vision" proposal is problematic because it is simply too far away from homes and businesses. The "Vision" proposal would not have the high ridership of the preferred alternative and is not consistent with the project's objectives. But this did not stop Surrey Downs residents from claiming the "Vision" proposal would "get rid of noise vibrations" and "increase ridership". There's really no need for Surrey Downs residents to freak out about noise pollution. If they're not bothered by auto traffic going by their homes today, then they shouldn't fret about light rail. Nevertheless, Sound Transit is prepared to help the community reduce noise pollution, whether it be from light rail or cars. According to Patrick McHugh, a concrete wall expert, it is possible to construct barrier walls which can completely mitigate any noise. If neighborhoods have whisper walls surrounding the light rail, the sounds will just bounce off each other. Soundproofing homes is also a possibility, the agency says. Sound Transit staff also presented other options they are looking at, including C9T, which is somewhat different from the preferred alignment. C9T has a Bellevue Transit Center station on 110th Ave and NE 4th St in addition to a Hospital station right next to Group Health north of NE 8th St and West of NE 116th St. In addition to C9T, two new at grade level alternatives are under consideration. C9A, an at surface alternative for C9T, and C11A. C11A would go from Main Street to NE 6th Ave at grade, link up with the existing Bellevue Transit Center, and then across NE 6th. On December 10th, the Bellevue City Council will pass along a recommendation to the Sound Transit Board detailing their preferred alignment. NPI urges the City of Bellevue to work together with Sound Transit to find the best option for East Link. We look forward to participating in and covering future workshops and stakeholder meetings. And we urge members of the Sound Transit Board not to let NIMBYism interfere with the final alignment decision. This voter-approved project is simply too important to Eastside neighborhoods to have its design dictated by a few vocal, fearful residents. Tomorrow, the Washington State Economic and Revenue Forecast Council is due to release its latest revenue forecast, which is expected to show that the state's budget shortfall will reach a staggering $2.5 billion. Governor Chris Gregoire and legislators have been preparing for the 2010 session under the assumption there would be a shortfall of between $1.5 and $2 billion, with the latter being the worst case scenario. But it's probably going to be even worse than that. Painfully colliding with this reality is House Speaker Frank Chopp's agenda for the 2010 session, which is still in draft and has yet to be approved by the House Democratic caucus. The agenda, which Chopp outlined in a presentation to King County Democrats last Sunday, comprises several initiatives. Protect against further cuts in services for people with mental illness, developmental disabilities, long-term healthcare needs, and chemical dependency. Re-direct existing revenues and increase funding for public schools, at both the state and local levels. We wonder whether such objectives are realistic or even possible, considering how serious the budget shortfall is. We say this not because we don't agree with these objectives, but because we doubt the Legislature has the courage or the resolve to find enough new revenue to prevent cuts to essential public services. After December, Democrats will be able to set aside the undemocratic, unconstitutional restrictions imposed by Tim Eyman's Initiative 960, but it is unlikely they will raise any of the state's three major sources of revenue (the sales tax, property tax, and the business and occupation tax). Sin taxes and fees will probably go up, however, and some of the more odious and unnecessary tax exemptions might be repealed. But that won't raise $2.5 billion. Washington State might not be in such a pickle if we weren't so dependent on consumption taxes. A new edition of the Institute on Taxation and Economic Policy's report Who Pays? was released today (PDF), and we get the dishonor of being the state with the most regressive tax structure. That's right: Out of all fifty states, Washington's tax structure is the most backwards. We're worse than every state that is governed by Republicans. That's pretty appalling. Here are some actual numbers: Washington's poorest residents pay an average of 17.3% of their income in taxes, and middle income families pay about 9.5%. But the Evergreen State's wealthiest families pay only 2.9%. This situation has existed for years, and was discussed in the Gates Commission report released back in 2002, but the Legislature has chosen to dither rather then do anything about it. Tax reform, even though it is desperately needed, is simply not on the House Democratic agenda that Frank Chopp presented. We have to ask: Why are we wasting this crisis? The governor said that to cut $2 billion, the state could eliminate all community colleges, close the Department of Commerce and close the Department of Revenue, and it would still only eliminate $1.72 billion. Cutting all state funds for the University of Washington and Washington State University would save $1 billion. And closing the Department of Corrections would be $1.6 billion. She did not advocate doing any of those things. So, to summarize, we've got Frank Chopp talking about helping with student loans whilst we have Governor Gregoire saying existing financial aid is in danger of being wiped out. By acknowledging the elephant in the room, Gregoire is at least sizing up the challenge and making it concrete, which is critical. The same cannot be said of Speaker Chopp, who should be delivering half hour presentations discussing options for tax reform rather than offering better and more memorable names for progressive policy directions. Yesterday, George Washington University released an analysis of what's going to happen in the health care industry as a result of the Stupak/Pitts amendment to the Affordable Health Care for America bill (H.R. 3962). The amendment bans federal funding for abortions and bars payment of federal subsidies to health insurance products sold in exchanges that cover most medically indicated abortions. Emphasis mine. You can read the report for yourself, but the upshot is that under Stupak/Pitts, the insurance industry would change its policies to eliminate health plan coverage for medically indicated abortions. It's one thing to believe that tax dollars shouldn't fund abortions of convenience, or abortions of "right now just isn't a good time for me to have a baby." If somebody screws up (no pun intended) and decides they don't want to deal with the natural consequences, I'm kind of ok with them paying for that on their own. They should still have access to legal, safe abortions, but let it be on their dime. It is, however, an entirely different matter to say that abortions that are necessary for the health of the woman shouldn't be covered by health insurance. Notice how "health" appears twice in that sentence? Can you spot the contradiction, Stupak? Take my sister. A few years ago, when she and her husband were just starting out in their new life together, she got pregnant. They were both delighted about this, until a couple of months later she woke up in the middle of the night doubled-over in pain. Cue the ambulance ride, the hours of fear and terror while waiting to learn what was wrong. Treatment: emergency surgery. Or in other words, a medically indicated abortion to protect the health and life of the woman. Of my sister. Now thank god they had insurance. Thank god her treatment was covered. They're already struggling with a mountain of student loan debt. Thank god that this medical emergency didn't put them in bankruptcy like so many Americans. My sister lost the baby, and she lost one of her ovaries, but she didn't lose her life, and she didn't wind up in the poor-house. And that's the real lie, the deep hypocrisy of politicians like Stupak and Pitts, who stand in the way of real progress for real Americans so they can score some cheap political points with conservatives. Because we all know that without coverage, treatment just doesn't happen. And without treatment, women like my sister will die. If medically indicated abortions aren't covered in any insurance plan you can buy from anywhere--which is what will happen under Stupak/Pitts--then those treatments aren't going to happen, and women will die. Stupak and Pitts and everyone else who voted for that execrable amendment they love to stand up and say they're all pro-life and pat themselves on the back and smile their smug holier-than-thou smiles. Well that's crap. It's a lie, pure and simple. There is no justification for clamping down on medically indicated abortions. There's nothing "pro-life" about that: if the mother dies, the fetus dies too. That's what's at stake in many medically indicated abortions. Eliminating health care coverage for those procedures doesn't save anybody. If the anti-abortion crowd has any shred of moral and intellectual honesty in them, if they're as "pro-life" as they claim, they'll call on the Senate and House to strip Stupak/Pitts out of the health care bill during the committee process. Because it's not "pro-life." It's a pro-death amendment. Make no mistake: under Stupak/Pitts, women will die. Vice President Al Gore is back in our beautiful corner of the country this week to talk about his new book Our Choice, which is a sequel to An Inconvenient Truth, although Gore wrote The Assault on Reason in between. Our Choice focuses on solutions to the climate crisis, rather than trying to explain the climate crisis (which Gore's 2006 book and Academy Award-winning documentary film did do rather successfully). During the three and a half years since the publication and release of An Inconvenient Truth, I have organized and moderated more than 30 lengthy and intensive “Solutions Summits” where leading experts from around the world have come to discuss and share their knowledge of and experience in subjects relevant to the construction of a plan to solve this crisis. As governments prepare for next month's global climate summit in Copenhagen, "the stated goal of negotiators is to enact measures that will have a 50 percent chance of avoiding dangerous consequences," Gore said, as if joking. "That is the very definition of recklessness." In solar energy, Americans first developed photovoltaic cells, but only one of the 10 leading manufacturers is based in this country, Gore noted. "Only one of the top 10 wind manufacturers is in the United States." Gore's observation has fortunately not been lost on Democratic leaders, including Senator Charles Schumer of New York, who recently made public his opposition to providing stimulus money to a pair of companies with plans to build a wind-farm in Texas with Chinese made turbines. The two companies (U.S. Renewable Energy Group and A-Power Energy Generation Systems) announced today, however, that they've decided to produce and assemble turbines at a new facility in the United States, which is a win for American jobs, although the companies have not pledged to rely on their forthcoming U.S. facility to supply turbines for the big Texas wind farm they've planned. Gore's schedule in the Pacific Northwest seems to be a busy one. He also spoke with Seattle Times reporter Craig Welch today and appeared at an event at Town Hall, hosted by Kim Ricketts' outfit, which was sold out long in advance. Gore will be in Oregon tomorrow; Repower America is organizing a rally in support of Our Choice outside Portland's Keller Auditorium, where he is speaking. We've just heard from several members of the State Route 520 workgroup that they've finally settled on an option to rebuild the highway from Interstate 5 to the Evergreen Point Floating Bridge across Lake Washington. By a vote of 10-2, the workgroup (comprised of lawmakers representing neighborhoods on both sides of Lake Washington) has selected the "A+ hybrid" as the recommendation going forward for the highway's west end. The two dissenting votes were Speaker Frank Chopp and Representative Jamie Pedersen, who both represent the 43rd LD. All the other workgroup members present and voting were in support of the A+ hybrid option, which incoporates several elements of earlier proposals that are no longer under consideration. Not included in the A+ hybrid option is an expensive, risky tunnel under the Montlake Cut, which is proposed in Options K and M.
It would not be bored, as were the Beacon Hill Tunnels, or the new tunnel under First Avenue that is proposed to replaced the Alaskan Way Viaduct. Instead, according to WSDOT's documentation, it would be built using either a combination of the cut and cover method and immersed tunnel method, or the sequential excavation method. Choosing the former would mean digging a trench under the Cut and lowering watertight tube sections underwater, then connecting the sections together. Choosing the latter would mean dividing the space to be tunneled into segments and mining each segment seperately. Either way, including a tunnel in the design would be ridiculously expensive and cause the cost of the project to be much, much higher. More specifically, the cost of Option M is estimated to be $3.35 billion; the cost of Option K is estimated to be between $4.07 to $4.1 billion. Compare that to the A+ hybrid, which estimates put at between $1.9 billion and $2.1 billion. (Keep in mind, none of these figures are the total cost of the Evergreen Point Floating Bridge replacement. All of these options are for the west end only). The A+ hybrid option calls for the construction of a second drawbridge across the Montlake Cut, right next to the existing span. The second drawbridge would force several homes to be demolished, but WSDOT's datasheet comparing the different options says that roughly the same number of parcels would have to be acquired to build a tunnel. It is true that a tunnel would result in less noise pollution (because some of the traffic would be underground) but the cost tradeoff is huge, and ill-advised considering how short of money the project already is. I wasn't going to say anything about the Link light rail train that derailed earlier today, but I feel compelled to after seeing the Seattle Times put the news front and center at the top of their website earlier this afternoon. There really isn't much more to the story than what I just wrote in the first few words of that paragraph above. An empty train was heading back into the SoDo maintenance base earlier today. It came off the tracks, smashed up a little guardrail, and was slightly scratched up. The operator was not injured. This minor incident - not unlike a fender bender or a bus breakdown - was promptly made a top headline by the Seattle Times and KING5, even though it's not a big deal. No one was hurt, there wasn't that much damage, and the system was not forced to shut down (although service has been delayed). Sound Transit is still trying to figure out how to get the train down off the aerial tracks and back into the maintenance yard, but this incident is hardly a top story. No transportation system is flawless. It's predictable but sad but there are glass half-empty people leaving comments on the Times' site that this incident demonstrates why we shouldn't have built light rail. What nonsense. By that logic, we shouldn't have any roads at all because people die in traffic collisions every day. The automobile is about the least safest means of transportation that there is. Look at the number of injuries and fatalities from auto collisions. The National Transportation Safety Board notes that over ninety percent of all transportation-related deaths occur on the highways (PDF); in 2007, 41,059 people were killed and 2.49 million people injured in auto crashes. No other mode of transportation approaches highway in terms of the magnitude of the safety challenge - waterborne transportation, the next most dangerous mode of transport in terms of deaths per annum - in 2007 accounted for a total of 769 deaths in the United States, less than 2 percent of the number of fatalities in the highway mode. An average of about 112 people died each day in motor vehicle crashes in 2007, meaning that a person died in a crash every 13 minutes. The economic cost alone of motor vehicle crashes was more than $230 billion in 2000, which averaged out to a cost of about $820 for every person then living in the United States. The number of catastrophic rail incidents, in contrast, is so small that the NTSB's annual report actually goes through each one they investigated and provides pictures. There isn't enough room in their annual report to talk about all of the car crashes where people died, of course, let alone the non-fatal crashes. So the train is actually a pretty safe place to be. The context I just offered is missing from both the Times story and KING5's report. That's because such context doesn't justify overplaying the derailment, which is what they're doing. It's easier and cheaper to focus on the trivial. And in the case of the Times, not having a print rival to compete with gives them less incentive to do as much serious and investigative reporting as possible. Unfortunately, things seem bound to get worse before they get any better. In 1985, Microsoft released the first retail version of its wildly successful Windows operating system. You probably can’t remember life before MS Windows, but this was actually the same year that Washington state last updated its high school graduation requirements. A lot has changed since then. Globalization and new technology have dramatically changed the job market that today's high school and college graduates face, which is one reason the state legislature increased the number of high school credits necessary to earn a diploma when it overhauled the state’s basic education system last spring. The Washington State Board of Education (SBE) calls these increased requirements Core 24, after the twenty four credits newly required for high school graduation. Core 24 was at the heart of the education reform bill that groups such as the League of Education Voters (LEV) and the Washington State PTA advocated so passionately for last winter. Right now, a legislative workgroup is working to implement the new definition of basic education that came out of that reform. Core 24 is on the group's agenda but word has it that it is not a top priority. And yet there are many reasons why it should be. Over half of community and technical college students who graduated from high school [in Washington] in 2006 took pre-college (remedial) classes in 2006-07: English, reading or math. This level of remediation cost students and the state $17.5 million. Some Core 24 critics warn that if requirements are raised more students will drop out of school, but that myth doesn't line up with the facts. Dropping out is complex and problems that lead to dropping out usually start long before high school. Some research has shown that increased expectations lead to better results, with more kids finishing school. On top of that, the SBE has found that more low-income students complete college when they have had a rigorous high school education. Sound preparation pays off. Current state requirements don't formally prepare a student for anything. We have an obligation to ensure all kids are ready to succeed in college and careers, not be shut out due to our failure to coordinate state policies. The real heart of the issue is that while most school districts exceed the state’s current twenty credit requirement, they do so on their own dollar. Right now, local levy money originally intended to pay for extras is going towards basic classes need to earn a diploma. By including a twenty four credit requirement in the state’s definition of basic education, the state will be required to fund the additional credits, giving school districts the flexibility to use their levy dollars for true "extras” and enrichment like additional foreign language classes and after-school programs. Core 24 should be a first step in implementing basic education reform. Updating and standardizing Washington graduation requirements will prepare our students for the modern job market and economy. The state should start its plan to fund a full range of courses for high school students, instead of just the twenty it currently covers. Longtime readers of the NPI Advocate know that we're big fans of Firefox, the free software browser by Mozilla. One of the reasons we think it's the best browser out there is the incredibly rich and useful add-ons that are available to extend Firefox and make it infinitely more powerful. Here are our ten favorite add-ons. CookieSafe. This add-on is a perfect companion to NoScript; it blocks cookies by default but allows cookies for websites that a user has marked as trusted. It also gives users the ability to delete cookies within the browser at any time. Cookies, for those who don't know, are little text files that websites place on visitors' computers to identify visitors. Cookies can be useful - they allow websites to avoid prompting a user to re-login with every page load - but like scripting, they should only be enabled for sites a user trusts. Session Manager. The latest versions of Firefox incorporate some of its functionality, such as the ability to restore accidentally closed tabs and recovery of a browser session upon restart after a crash, but Session Manager is still an add-on worth having. It keeps track of what windows and tabs have been recently closed and stores session information for easy retrieval, making it easier to find that web page that should have been bookmarked, but wasn't. ChromaTabs Plus. Ever wished it was possible to give Firefox tabs different colors so it's easier to identify what's what? Well, there's an add-on that does just that. ChromaTabs Plus utilizes site favicons to generate a rich palette of colors for different tabs. It makes a Yahoo tab purple, a Bing tab blue, a Seattle P-I tab grayish green, and so on. It dramatically improves the user experience while adding a rainbow of colors to Firefox's interface. Lazarus. Everyone has a horror story about losing data that was typed into a form. Lazarus Form Recovery provides peace of mind by encrypting and saving input typed into any web forms within Firefox, permitting one-click recovery in the event of a submission failure, browser crash, power outage, or broken Internet connection. Lazarus even works with rich text editors and AJAX forms. It can save blog posts, application information... anything typed into a form. Weave Sync. Created by Mozilla Labs, Weave Sync allows bookmarks, browsing history, passwords, preferences, and tabs to be shared across different installations of Mozilla Firefox on different computers. Browser data is saved, encrypted, and transmitted securely to a Mozilla server so it can be continuously synchronized. This makes it possible to bookmark a webpage at work, for example, and then access that same bookmark at home several hours later. Forecastfox. Why spend time looking up the weather forecast when there's a tool that brings it right into the browser interface? Forecastfox helpfully shows what the weather will be like for the next seventy two hours at any given location. It also has built in buttons for quick access to a five day forecast and hourly forecast, and can display notifications that alert a user when conditions change. Adblock Plus. The tagline Ads were yesterday neatly sums up Firefox's most popular add-on (downloaded nearly a quarter of a million times) which excels at neutralizing ads that don't get already get stopped by NoScript. Adblock Plus is for the most part a "set it and forget it" tool; it comes with preset filters that eliminate most ads without any user intervention. But it also allows users to block unwanted content with a few simple mouse clicks. Greasemonkey. This add-on allows users to extend the capabilities of websites with custom scripts. No programming knowledge is needed to use Greasemonkey, as there are thousands of scripts already available to tweak the interfaces of websites like Digg, Facebook, and StumbleUpon. Some of the best Greasemonkey scripts have become fully fledged Firefox add-ons of their own. BetterPrivacy. Removes cookies from a machine that have gotten past CookieSafe or were present before CookieSafe was added on to Firefox, including what are known as Local Shared Objects. LSOs are essentially "super cookies" created by Adobe's Flash player plugin which store highly specific personal and technical information, never expire, and can transmit said information to companies like Google without a user's knowledge or permission. BetterPrivacy can erase these Local Shared Objects periodically to protect user privacy. Of course, not every Firefox add-on is in the same league as these ten. Perhaps the worst add-on we've ever seen is the Adobe Download Manager (DLM), which is "powered by getPlus". This add-on is nothing but poorly engineered, redundant bloatware that gets in the way and adds no value to the browsing experience. Adobe is trying to trick Firefox users who follow prompts to upgrade Flash Player into installing the Download Manager add-on. Shame on them. When visiting Adobe's website to upgrade Flash Player, be sure to click Cancel when the screen suggests installing "Adobe DLM". Then, on the underlying page, choose the Click here to download click to get only the Flash Player upgrade. Those who have accidentally installed "Adobe DLM" can get rid of it by going to Tools > Add-Ons > Plugins and clicking the Disable button next to "Adobe DLM".